I'm yet to come across someone who doesn't like the Soap & Glory bath & bodycare range and I'm by no means an exception to this rule. As such, I was excited to try out their signature shower wash, Clean On Me Creamy Clarifying Shower Gel. I realise that I'm more than a little late to the party in trying out Clean On Me but it was worth the wait- in fact, I'm not sure what took me so long. Presented in a large plastic bottle which features the signature Soap & Glory retro style imagery and cute slogans, I found the packaging to be fun yet functional thanks to its pump dispenser. The formula is that of a creamy gel which gives an impressively rich lather meaning that a little goes a long way- seriously, the 500ml bottle will last for a long time! 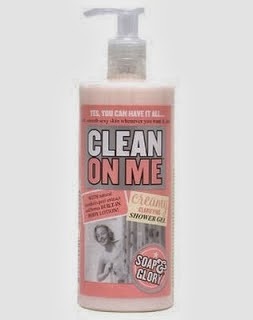 As tends to be the case with Soap & Glory products, Clean On Me has an incredible scent because it's fragranced with the signature Soap & Glory "Original Pink" perfume. The feminine scent lingers delicately on the skin after showering. Despite the high concentration of SLS, I was impressed to note that Clean On Me lived up the moisturising claims and didn't dry out my skin as is usually the case with SLS laden body washes. Soap & Glory Clean On Me is a very popular product and it's easy to see why. It feels far more indulgent than the wallet friendly price tag would suggest. At just £6 for a very generous 500ml, I feel that Soap & Glory Clean On Me offers fantastic value for money and I wouldn't hesitate to recommend it.